When I booked Montreal with little time to plan, I sought the help of friends to guide me to great spots in Montreal. Ben reached out to his friend Joe, who emailed back a great list. Actually, his suggestions were for some of the same places that were already on my list, but I thought it was great because it helped verify that I’d chosen well. I appreciated that there were also a few unknowns(to me) which gave me more options to choose from when deciding my itinerary. Ben mentioned that he’d try to arrange a dinner with Joe, and after seeing his recommendations, I was more than happy to let him choose a spot for 1 of our 3 dinners in Montreal. When we arrived in Montreal, Ben received confirmation that we had reservations at Grumman ’78. 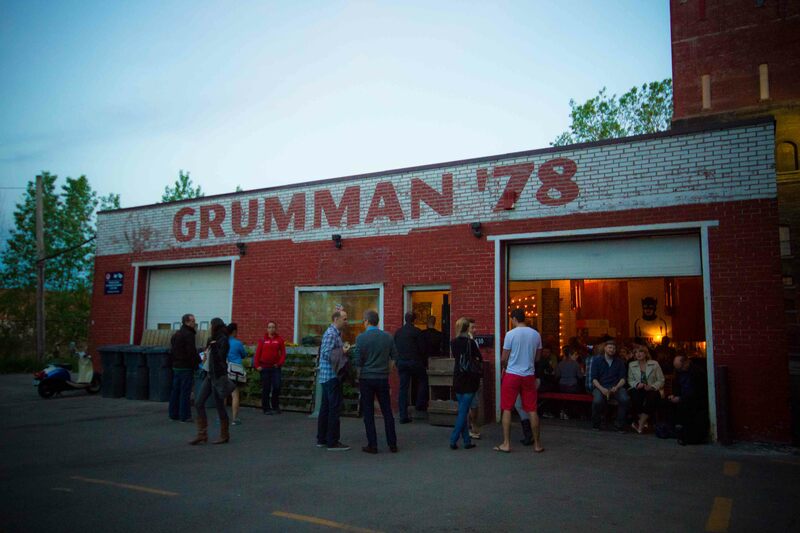 I’d read about Grumman ’78, seen it on Anthony Bourdain’s Layover and from what I knew, I was cautiously optimistic about our evening. I knew Grumman ’78 for being a food truck that can’t serve food on the street because Montreal’s laws prohibit them from doing so. But Montreal’s laws are changing so it will probably be soon seen more than at various events and outside specific venues. I’d never read anything about a restaurant based out of their headquarters, which is where we had our reservations, so I was intrigued. Ben and I made our way for pre-dinner drinks at the Burgandy Lion. It was a funny coincidence because we noticed the Lion the night before as the place that Frederic Morin from Joe Beef/Liverpool House tucked into to take a break from his restaurant activities. I was happy to pull up a seat at the bar and meet the man who held my dining destiny for the evening. I was happier to find out Joe and his friend turned out to be fantastic people who made me feel at ease. It’s been a long time since I’ve been out with people who I didn’t have to talk work, dragon boat or kids with. I felt energized and inspired to be hanging out with people who seemed to be living life passionately and creatively. I was also happy that Ben warned them in advance that I’d be documenting the evening, so I didn’t have to feel awkward when I pulled the camera out. 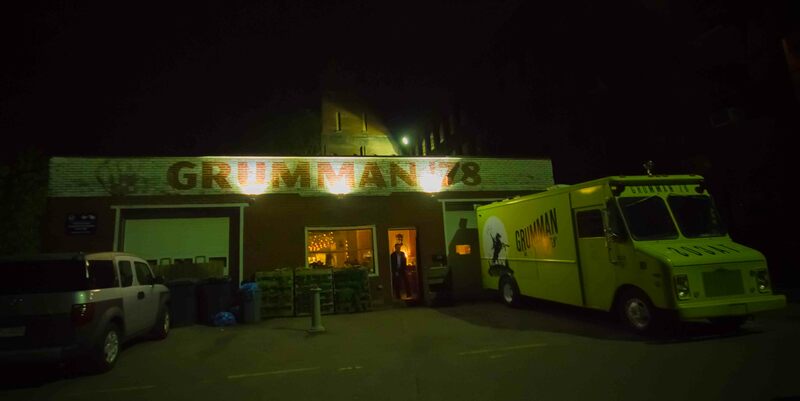 After a couple of drinks, we hopped into a cab and made our way to St-Henri, where Grumman ’78 is located. As we pulled into what felt like a deserted area, I saw some action around the doors of an old garage. As we piled out of the cab, I realized we were at our destination. A huge smile broke out onto my face because I knew we were in for a great experience. I felt like we had arrived in the land of the “cool kids”. Our seats weren’t quite ready so we started with a drink at the bar. 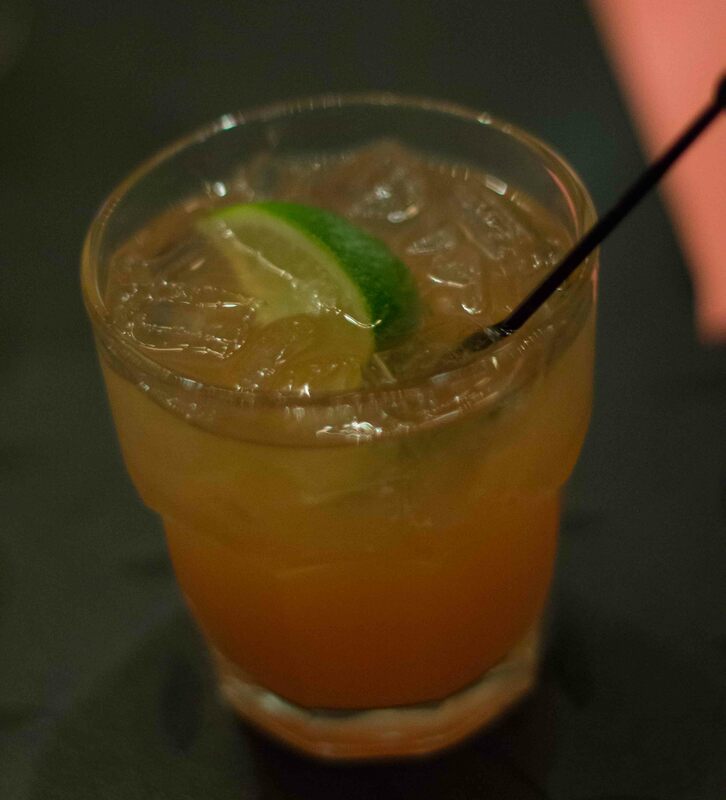 My spicy lemonade could have been a bit more piquante, but was good nonetheless. The menu at Grumman ’78 changes frequently so some “favourites” were nowhere to be seen. There were some dietary restrictions around the table, but it didn’t seem to stop us from ordering a good sampling of the menu. 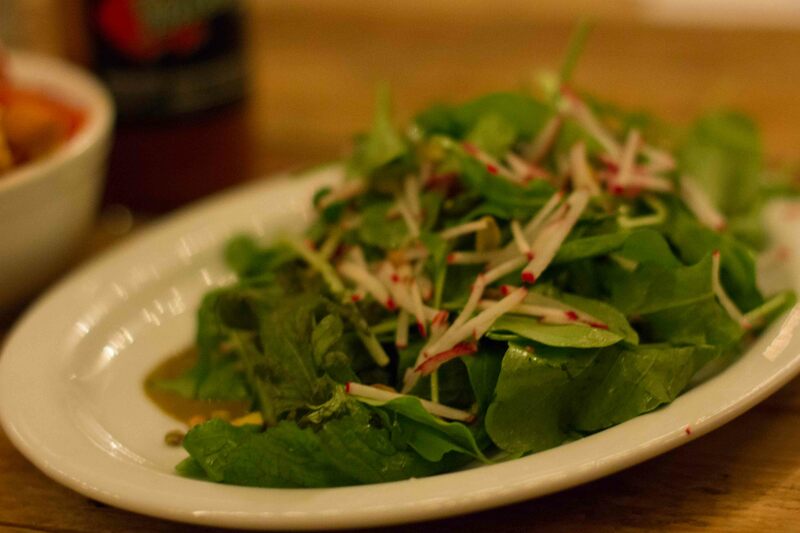 Salade de Roquette au beurre de pistachio – A delicious combination of peppery arugula, spicy radishes and nuttiness from the pistachios. 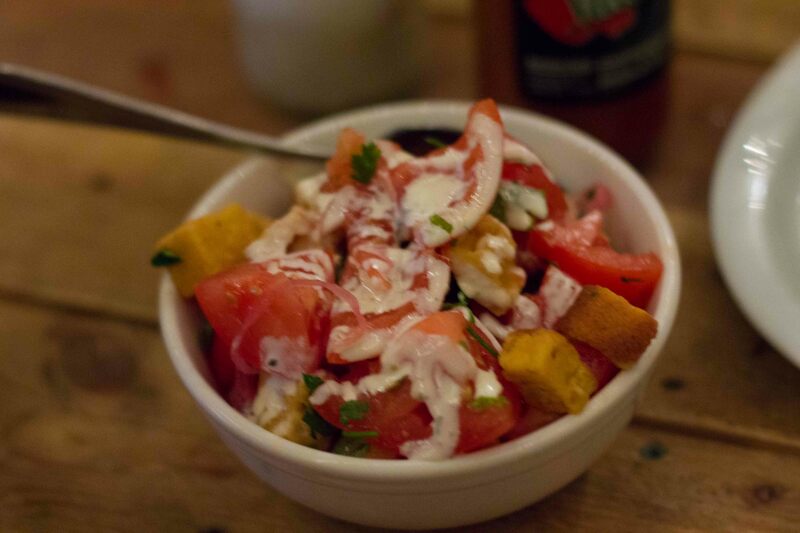 Salade de tomates et pain de mais – Loved the twist on panzanella by using corn bread which seemed to enhance the sweetness of the tomatoes. Why are the tomatoes in Montreal so delicious? 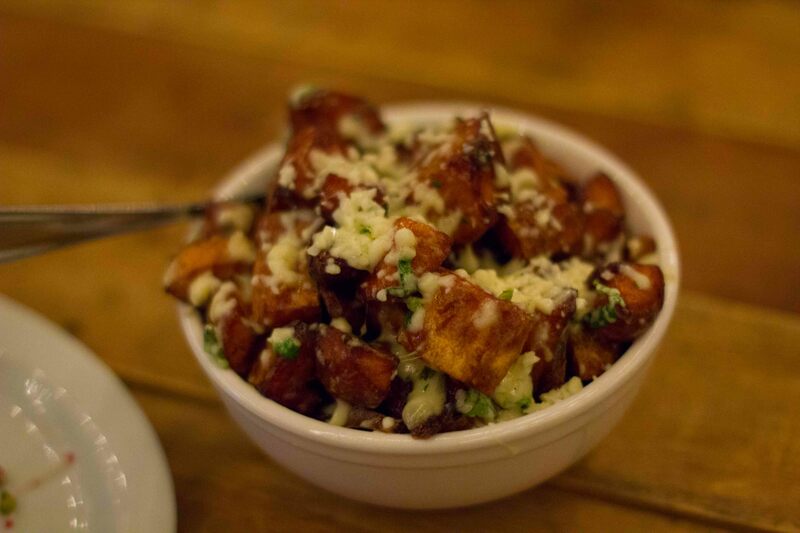 Pappas G78 – Fried sweet potatos topped with aoli and cheese were very tasty. 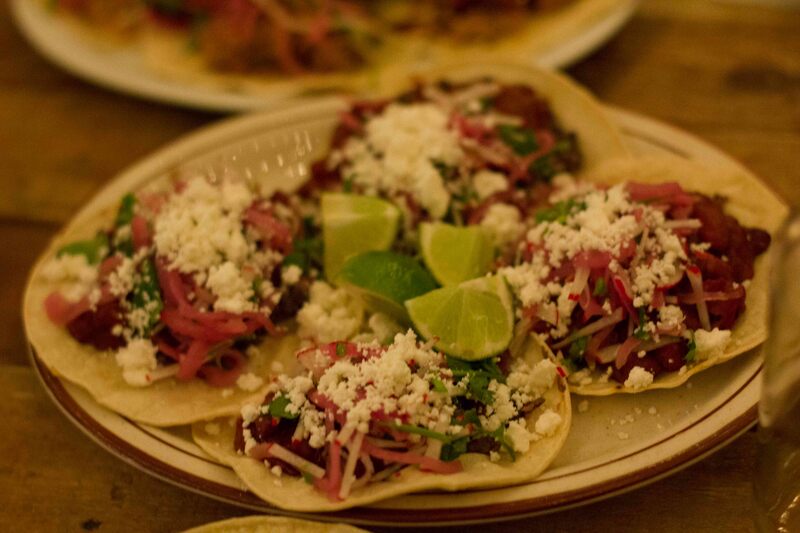 Tacos Pimenton Feta – Pimenton braised refried beans are topped with crunchy veg and feta. 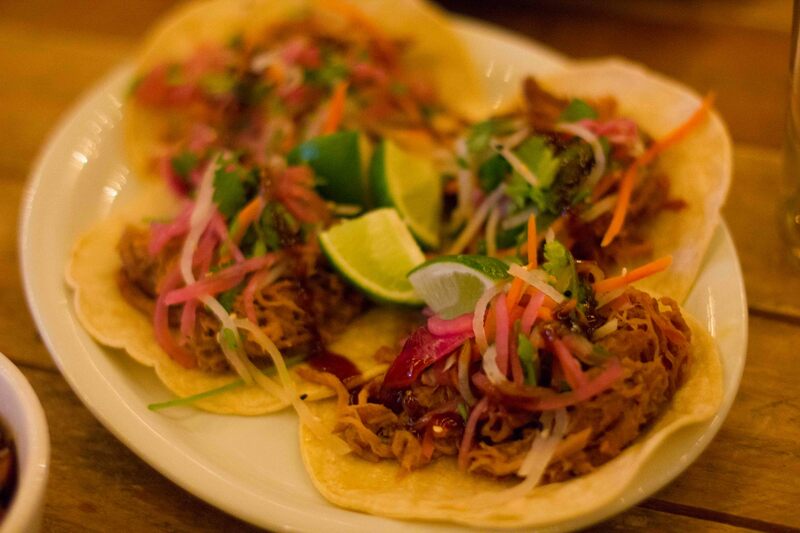 Tacos Porc Bahn-Mi – Flavourful shredded pork is sweet and salty and topped with pickled carrots and radishes. My favorite taco of the night. I admit that when I heard we were going to Grumman ’78, I was somewhat doubtful that I would be able to embrace the experience. I am a taco purest, or at least I like “real Mexican tacos” so much that I don’t understand the need to add fusion and flair to them. People have been singing the praises of the Korean tacos at Kogi truck in LA for years, but I haven’t been able to get over my skepticism to seek them out. But just as I’ve learned to enjoy the Rainbow, Caterpillar and Spicy Cactus rolls at my local sushi restaurant, I knew that I had to embrace the taco in its new world form. I went in with an open mind and was rewarded. 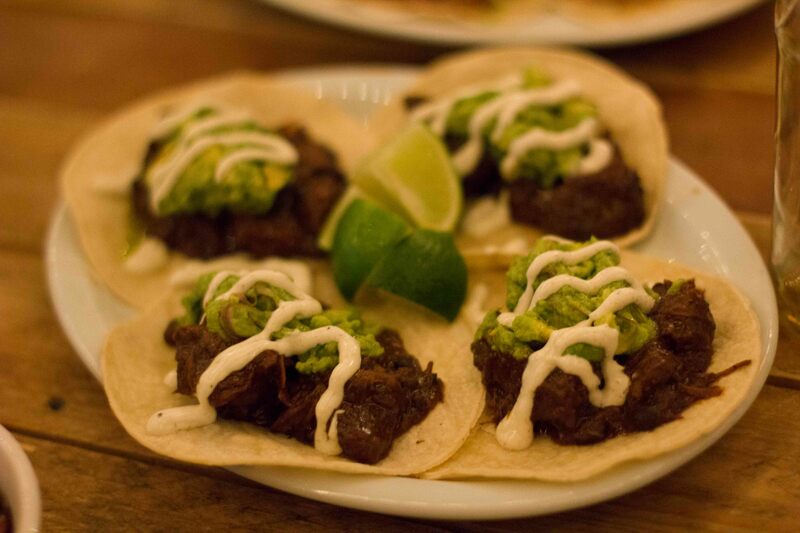 These tacos were good. After dinner, we continued around town in Montreal where conversation seemed to flow as easily as the beverages we were imbibing. Over the course of the evening, we talked a thousand different topics, some of which I can’t keep straight in my head but I was happy to end the evening with some great parting gifts. The first was a list of recommendations of “off my grid” places to check out the next time I’m in New York and the other was the link to Joe’s recently released EP which is fantastic. The Joe Halston Band, Crackhouse Ballads can be heard here.